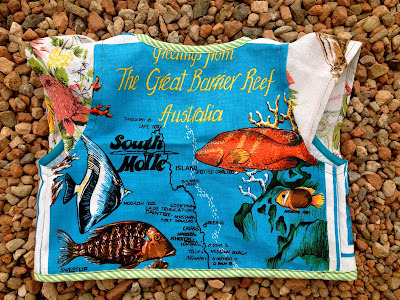 One of the great things about making custom clothes for people is the opportunity to make things from other peoples' imaginations. When Zara contacted me with her dress request (which is part of the July teatowel-a-thon), she came well prepared, with a selection of pictures of frocks and details she liked. This gave me a great foundation from which to start working on a shift dress for her. Some things, she was quite definite about: she wanted doily pockets, for example. Other details were a little more general: native flora and fauna was put out there as something she might like, and lacy details were also mentioned with some enthusiasm. She also definitely wanted a shift dress, which was fun, because I've only ever made one before, years ago, for a friend's daughter's year 12 formal. It was gold lamé, and she looked awesome. Zara's dress is a few steps away from the uber glam nature of the last shift I made (just a few...) but no less awesome. I am so happy with how it turned out, so pleased with how it looked when I hung it from a tomato stake in the veggie garden to take the photos, and so grateful to Zara for taking me out of my comfort zone. I've never made a dress completely from teatowels before, which is somewhat bizarre. I love the look of the finished teatowel 'patchwork' that makes up the dress. I think the pretty little wrens and wildflowers look perfect alongside the doily cap sleeves and pockets, and gorgeous polka-dot bias trim. As you can perhaps tell, I'm a little bit in love with this dress, and am thinking something similar may well be on the cards for myself, one day, if I ever got time to sew something for myself... I can always dream, eh? So thanks Zara - I feel like this was a beautiful collaboration between your ideas, and my sewing skills and fabric collection. Nice work! I hope you love it even half as much as I do. As I think I mentioned before, the teatowel-a-thon is chugging along quite nicely, and we're almost ready to purchase our sausage-making equipment. Yee har! Thanks so much everyone for your orders. It's been really fun to work with you on creating some new things. 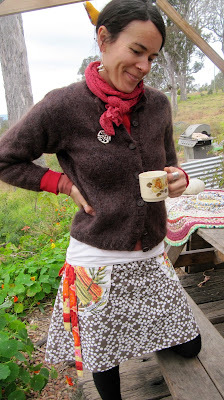 Of course, there have been some old favourites, like this bolero I made for Amy, in Melbourne. 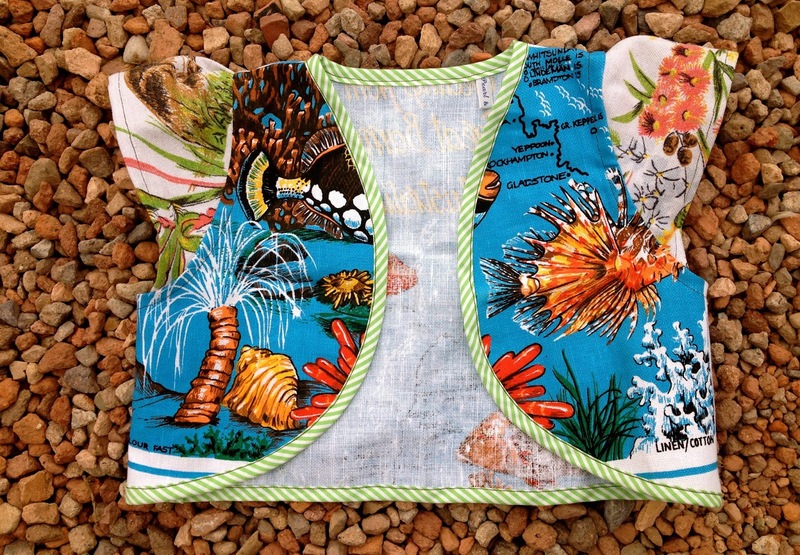 Tried and true, the teatowel bolero is always fun, because each teatowel/bias binding combo means that they're all new, and they all have their own character. Yay for handmade character-filled clothes, I say. I have also had orders for new things, like pinnies and shift dresses, which I've never made before, so enjoyed the challenge of adventuring from my sewing comfort zone. 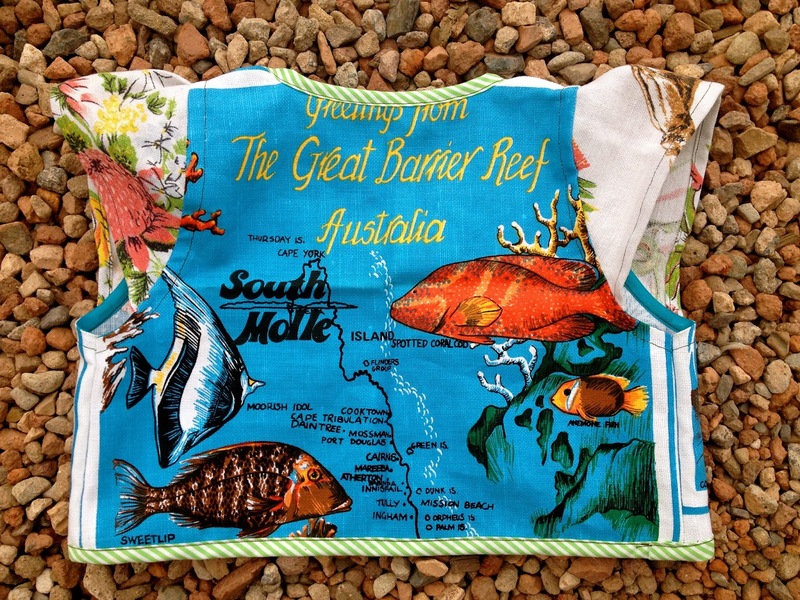 Quite early on in the sale I got a request for a blanket with Australiana patches. What a cool idea! Strangely, the thought had never crossed my mind before, so was grateful to Jillian for raising the suggestion. Luckily for Jillian and I, my mum had recently been to a garage sale and picked up some brand new, still in their packets 100% wool blankets. They're bloody beautiful, and this green plaid was, I thought, perfect for a spot of Australiana embellishment. I picked out a few choice patches - animals, birds, flowers, and an amazing, embroidered black swan - and got to work. I don't often sew things this big. I think the last big thing I sewed was a bedspread I made for Pearl a few years ago. So I'd forgotten how tricky it is to get the big thing - in this case a thick, snuggly wool blanket - around the sewing machine. I suppose there are sewing machines especially made for sewing big stuff?? I don't believe mine is one of these, and I find the sewing of big things slightly challenging. But thankfully, not impossible. After wrestling with the blanket and the patches for several hours, I spread it out in the sun and admired my handiwork. I was pleased. It reminds me of a scout blanket (in a good way!!). The snuggly green wool and the bright Australiana patches work perfectly together, and I can't wait to see what it looks like on a bed or couch. It'll definitely keep you warm Jillian! I hope you enjoy your blanket and bolero girls! I certainly enjoyed making them for you. In pursuit of my inner-fermento.. Some time ago, you may recall, we got a little excited about our foray into the world of kimchi creation and kombucha making. That first batch of kimchi has been happily eaten, and the kombucha continues. Each day we drink a little in the pursuit of superior gut health. Ah yes, gut health. It's my new obsession since reading Michael Pollan's latest book, Cooked - A Natural History Of Transformation. Have you read it? Oh my, it is so so good. Yes so we had become quite besotted with Sandor Ellix Katz and his Wild Fermentation and The Art Of Fermentation. And you may recall that Annie had to stop reading Sandor before bed because she would just get too excited about all the fermenting possibilities in the world and sleep would never come... Yeah so Sandor is of course featured in Cooked and the combo of Sandor and Michael proved irresistible for me. My life as a fermento has begun. There's more and more research being done that shows a link between gut health and overall health. There's research looking at the link between our gut health and our emotional and intellectual functioning. And there are links between gut microbia and particular illnesses. Really, it's fascinating stuff and for me, makes a lot of sense. I think it fits with my general interest in and approach to eating. I am anti-fad, I am for real food, especially foods that have been eaten for long stretches of human history. My first fermentation projects (after kimchi and kombucha) have been a series of vegetable ferments and a revival of our homemade yoghurt. We've been making our own yoghurt, off and on, for a few years. It's easy to get out of the habit, which is a little odd because it is so easy to make. Now we're back in the home made yoghurt zone because we're aiming to eat as simply and as locally and as well as possible. And we're being thrifty. We have another house to build, which means a little less of the $9 organic yoghurt and a little more of the homemade stuff made with the superb Tilba milk. It is a truly divine unhomogenised Jersey cow milk, from just up the road a little. We all get a bit of thrill when in the morning we have to scoop out large chunks of cream from the top, before pouring the milk onto our porridge. You'll be unsurprised to hear it makes a splendid yoghurt. Check out that creamy top layer.. I have always eaten plain yoghurt and as far back as I can remember, yoghurt with raw honey has always been a favourite treat. I always knew that natural yoghurt was good for your gut but I don't think I ever made the connection between the health benefits of yoghurt and the myriad bacteria riddled fermented foods the world has to offer. Strange, I guess I wasn't really thinking. And so I thank Sandor and Michael for illuminating me to the powers of this microbial universe. 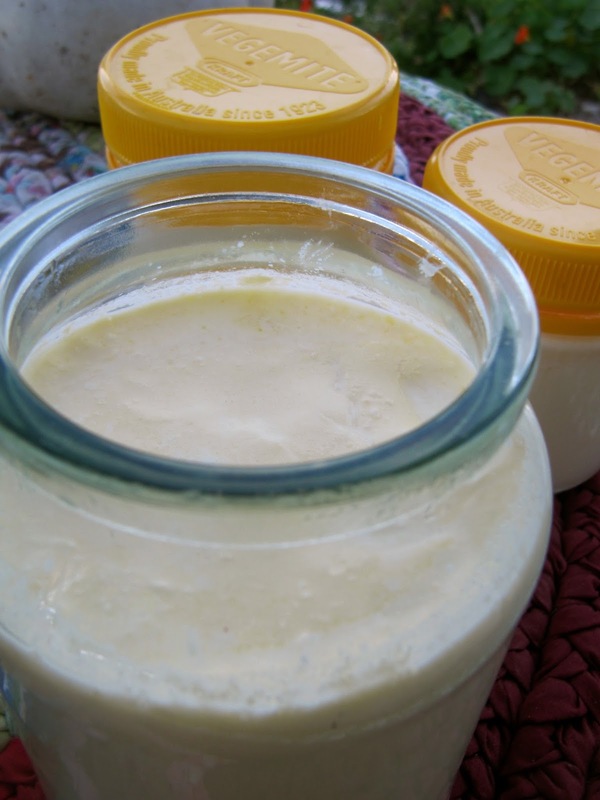 Our yoghurt making method has been perfected over a couple of years and I'm happy to share. Basically, you heat milk in a saucepan to 90 degrees celsius then cool to 50 degrees. Place a big tablespoon of natural yoghurt in a jar or 2 or 3 (I generally use Marrook Farm Greek yoghurt as it contains a range of cultures). Once the milk hits 50 degrees, pour it into the jar(s) and give it a quick stir. Then you need to keep the jars warm for 6-8 hours or overnight. You can do this in any number of ways. Our current method is to pour some 50 degree water into a small esky. I then place the warm jars into the warm esky and close tightly. After 6 hours you will have over a litre of delicious creamy natural yoghurt for less than $2.00. It's seriously good. My next fermentation joy has been some simple vegetable ferments. It's really very mindblowing to think that you can put some veg in some salty water and leave it for 5 weeks and in that time it is transformed into something utterly delicious and uber-healthful. I don't know whether I wasn't paying attention in high school science or whether we just didn't learn this kind of stuff. Luckily Sandor explains how it works - the bacteria responsible for the fermentation are wild strains of lactic acid bacteria, lactobacillus. They thrive in the anaerobic salty environment of the briney vegetables, and get to work converting the sugars in the vegetables to lactic acid which poisons all the bacterial competitors. All that lactic acid gives the ferment it's tang as well as it's preserving qualities since not much else can survive in such a low pH environment. Amazing. I got a little bit excited at our local produce market and came home laden with turnip, radish and carrots. I also picked some chard from our garden, using the leaves in a stew and chopping up the stalks ready to give them a new fermented life. I mixed up a brine that was comprised of around 10% salt to water. In retrospect it may have been too much salt. Next time, I'll try for 5%. Heat the water and add the salt and stir until dissolved. Meanwhile, pack your veg into your jars. I also added garlic cloves, bay leaves and some coriander seeds to the carrots and some cumin seeds and chilies to the chard stalks. Pour in the brine. Then remember that oxygen is the enemy. You need to keep the veg weighed down in the brine so use whatever will work. Glasses and jars of water seemed to work ok. But still some bits would find a way to the top and catch a little too much air and would form some mould. No drama. You just scrape the mould off. I know it may sound disgusting, but it's really not. You end up with vegetables that are somehow more. Makeshift fermenty zone. Looks dodgy but actually pretty successful. Then when you are happy with the level of ferment, you just seal them in a jar and store them in the fridge. They will continue to ferment but very slowly once refrigerated. The vegetables are transformed. So crunchy, so flavoursome. In normal life, I have little interest in radish or turnip but as fermented foods they are pretty special. Eating them as a part of a mixed plate has been my favourite way to go - sourdough bread, cheese, salad and ferments. Oh yeah, so good. As you may well know, I'm rather partial to a spot of bartering. Getting goods and services from someone in exchange for goods and services you yourself have made just feels kinda good. It's hard for people to be greedy, or unfair, when it comes to bartering. Getting rid of the whole money hoo-ha also means that you can take charge of your time more easily: The less money you need, the more opportunity you have for doing things that are fulfilling and that make you happy. Obviously, there are things in the world you just need money for. I'm not saying that I'm heading for some kind of cash-less living situation (as attractive as that sounds). But trading a bunch of kale or 3 for a fresh rabbit or loaf of bloody gorgeous home-made German rye sourdough is happy-making, and it means that you get the things you need/want, but can't make yourself, with your own 2 hands. This increases self-reliance, and cuts out that (often unpleasant) middle-person who, in a normal money economy, you just sell your time to, so you can get money to buy the things you need/want. Who needs that guy?? Bartering also strengthens community (and I reckon this is my favourite bit) - getting to know the person you're getting your gear from helps you to appreciate their craft and the work that goes into creating whatever it is you're getting from them. You have a conversation with them, you thank them and pay them a compliment, you make friends with them. Happily for us, we've met quite a few people of late who are more than happy to trade their knowledge, expertise and wares for our knowledge, expertise and wares. Sweet! Of exceptional note are our new friends Gab and Mick, who are totes up for bartering all kinds of stuff, most notably, Gab's bloody gorgeous RedPeg Eco Studio jewellery. Being as I am a lover of the bauble, yet chronically dismayed by the ethically dubious nature of most jewellery, it was pretty delightful to discover that Gab is, amongst other things, a most talented creator of ethically and environmentally sound jewellery. Moreover, she has been happy to trade her wares for a few P&E bits, and it looks like this relationship could continue into the future. ACE BALLS! Yes folks: these earrings say "grow more food". Outrageously cool. I find Gab's jewellery pretty much irresistable. For example: I got my first pair of RedPeg earrings a couple of months ago. I HAVE NOT WORN ANY OTHER EARRINGS SINCE. Yes folks, she's that good. and a brown spotty wrap n go with Australian flora pockets. I feel like I totally got the good end of the stick with this situation. But then again, that's the other awesome thing about bartering: often-times both people think they've gotten the best deal. A couple of weeks ago, our friend Brett shot a rabbit for us. Around his parts, rabbits are a major pest, so he often shoots them and either eats them or 'plants' them in his garden. Having never eaten rabbit before, and recognising feral bunny as an excellent protein source, we asked Brett to bag us a bunny next time he was out shooting. He happily obliged, and delivered a neatly dressed, fresh Brogo rabbit in exchange for a bundle of greens from the garden. Awesome! When it came to cooking the rabbit, we knew that a slow braise was on the cards, just because that's usually the way we like to go with meat. Matthew Evans helped us out, once again, and we went for his rabbit ragu with papardelle, from Winter on the Farm. The problem with a slow braise for us is that our cooking options are kind of limited on account of the no kitchen factor. We have, in the past, slow-cooked things in the BBQ, with the hood down, but have found this uses a LOT of gas. Next option is a fire, which is our ideal cooking method, especially once we have some better timber options on our land. For now we make do with fallen branches (there are heaps around!) and generous deliveries of firewood from friends (like Brett!) who have more trees on their properties, and the odd bit of hardwood picked up from the tip. For fire-baths and a bit of fire-cooking, this is working fine for now. Fire-cooking, though, has proved to be a little tricky to master. Things like gozleme, which we cook on a hot-plate over the fire, have worked well for us, and were what got us excited about the possibilities of cooking on the fire. We've also made flat breads cooked in the ashes (inspired by Moro), which were outrageously delicious, enjoyed as they were, sitting by the fire, snuggled on blankets, with a lentil soup, watching the sunlight fade. For Christmas Pearl got a camp oven, and a camp oven cook-book, and we were wowed by the possibilities of what we could do with the camp oven. Chocolate cake! Scones! Bread and butter pudding! The realities of the camp oven, however, have proved to be a little tricky, and we've faced more than a couple of failures. But we keep trying and finally, with the bunny, the camp oven ca,me through for us. The ragu ended up simmering away on the fire for almost 4 hours. We kept topping it up with red wine and tomatoes, and in the end, the meat had fallen from the bones into a delicious, perfect sauce. The sauce, with some egg pasta and our first broccoli harvest, was amazing. And rewarding. And happy-making. And now we have a little more confidence to try some more things in that camp oven. having learnt some more lessons in the arts of the fire-cook. The kids test the first round of ash-cooked flat-bread. Success! This morning Olive and I set to work preserving the several kilos of lemons we've accumulated over the last few weeks. We've picked them from friends' trees, been given bag-fulls, and even bought some at the farmer's market just because they're sooo good and cheap this time of year, and we were running pretty low on preserved lemons. If you've never tried preserved lemons before, you should give 'em a go. They're super-tasty, and super-easy to make, so you can have lemony deliciousness all year round. We mostly use them in roast chicken, or salads like this one, which also uses yummy nasturtium capers. You'll also find them in lots of middle-eastern-type recipes. Anyhoo, lemon-preserving has been a pretty regular activity in our house for a few years now, just because they're so easy, and so so delicious. All it takes is a sunshiny morning, a few bowls of lemons, some salt, cloves, cinnamon and bay leaves (and, if you're lucky, a little helper or 2), and you have yourself a few months's worth of preserved lemons, plus some for friends. We used Stephanie Alexander's method, which is to quarter your lemons, then rub them well with a lot of coarse salt (though we used fine salt this time because the co-op had run out of coarse. I think the fine was OK, but coarse is better). The juice will mostly squeeze out during this rubbing process, and you'll end up with a bunch of super-salty lemon juice at the bottom of your bowl. Then you pack the lemon quarters, with some of the juice, a couple of cloves, a bit of broken cinnamon quill and a bay leaf or 2 into sterilised jars. Wipe the rims of the jars, and put the lids on tight. Then you need to leave them to do their thang for a few weeks, or a couple of months, if you can wait that long. Like home brew, they get better the more patient you are. Olive and I were up on the road yesterday, gathering a wheelbarrow full of sand for the base of our wood fired oven, when I noticed some bright green, kind of luscious looking patches in the pasture at the farm across the road. My hunch told me they were stinging nettles, and closer inspection proved my instinct to be correct. Hooray! Discovering the delectable joys of the stinging nettle has been a highlight of our foraging and weed-eating adventures. In the spirit of seasonal eating, however, we haven't had any for a while, so when I saw those sweet sweet bright green nettle plants yesterday, I knew that nettle soup and/or risotto and/or pasta would be on our home menu sooner rather than later. Tonight, in fact! Collecting nettles is fun, in that forage-y kind of way (goes something like this: Free food! Wandering around some place you don't normally go unless you're looking for free food! Anticipating the deliciousness you're soon going to be enjoying!). A bonus on this particular forage were these enormous mushrooms that were also enjoying the neighbour's cow pasture. My complete lack of mushroom-identification skills and a pretty strong desire to not poison my entire family made me leave the mushrooms alone, however. I was content to just give them a sniff (mmm... mushroom-smell...) and have a little daydream about some day in the future when I am a super-competent mushroom-identifying guru. Also, I had a big bowl of nettles to enjoy! One culinary pleasure at a time eh? 1. Give your nettle leaves a bit of a wash. Ours came from a cow paddock, so I wanted to get rid of any cow poo and wee hanging around on the leaves. 3. Toast some nuts. I used almonds and macadamias and a few pine nuts. 4. Whiz up the nettles, the nuts, about 5 cloves of garlic, some olive oil and some parmesan in a food processor. 5. Stir the nettle pesto into cooked pasta with some halved cherry tomatoes (I know - we're lucky) and some torn basil leaves (yep - really lucky) and feel your heart swell with joy as you watch your family devouring the bowls of super-nutrition you have prepared. So far, the teatowel-a-thon has been fab! A nice steady flow of orders, getting us ever-closer to our goal of purchasing a sausage cannon, but not enough to make me overwhelmed, and leaving me time to work on my other projects like rag rugs and crocheted stubby holders and the platform for our wood-fired pizza oven. Balanced. Not insane. Just the way I like it. And I've had some lovely folks making special requests for various teatowel themes for their boleros/cushion-covers/pinafores and frocks, which has prompted me to look quite thoroughly through my collection to take stock of what I have. After posting the gorgeous still life last week, and finding a few more choice still lives in the rummagings, I thought it might be nice to do a still life themed post. In one of those kind of fortuitous/spooky/funny coincidence things, when I uploaded the photos I took today of a handful of still life teatowels, I also uploaded some photos from this week that are beautiful little still lives of their own. Just hanging out there on the camera, moments that I just found to be beautiful and so took a photo with no particular plan for them. They both feature goings-on from our big outdoor table. Even now, in (almost) the middle of winter, it's so central to our lives, every single day. It's bathed in sun all day, from the moment the sun comes up til the moment it ducks over the western hill, and I'm particularly in love with sitting out there in the sun stitching up the big coiled rag rug I've been working on for.. well... about 2 years. But that's another story. The table is also our eating-place and our crafting place and a playing place and a place for the kids to climb up to escape from the neighbour's dog who's threatening to steal their bikkies out of their hands. It's where we wash and tie up our bunches of veggies each week before we take them into town to sell to the co-op. It's where we chop up food and do the dishes, and it's where I cut out and sew whatever clothes I'm working on. And sometimes things look so beautiful on it (sometimes it just looks plain messy) we just have to take a photo. And I guess that action makes the life of our table be still for just a moment. The still lives of the teatowels, on the other hand, are waiting to be given a new life! They're waiting to be unfolded, to be cut (sorry Kylie!) and re-made and worn by people who are going to the markets and out to see music and to have tea with friends. These still lives are waiting to be made into cushion covers to decorate and soften couches and sleeping nooks, and to see the light of day once more.